It was an off night, where everything went crooked. San Francisco couldn’t make up its mind about whether it was raining or not. I was supposed to go to another bar, but when I passed The Monk’s Kettle on 16th and saw there was plenty of space, I changed plans. It always pains me that what can probably be described as San Francisco’s premier beer bar is such a small space. The bar is tiny, the indoor tables usually reserved for customers looking to eat a meal, the outdoor tables are usually impractical at night, and it gets crowded fast as soon as the meme factories (or whatever people do here now) close – so if you want to sit in perhaps the city’s best beer bar nursing a distinct beer, you almost always have to arrive during off hours. To look through the window at night and see so much free space? I jumped. It’s always on the dark side, which is one of the things I appreciate about it. The extraordinary beer list generally includes just under 30 beers on tap, about 150 different bottles, and a cask engine. 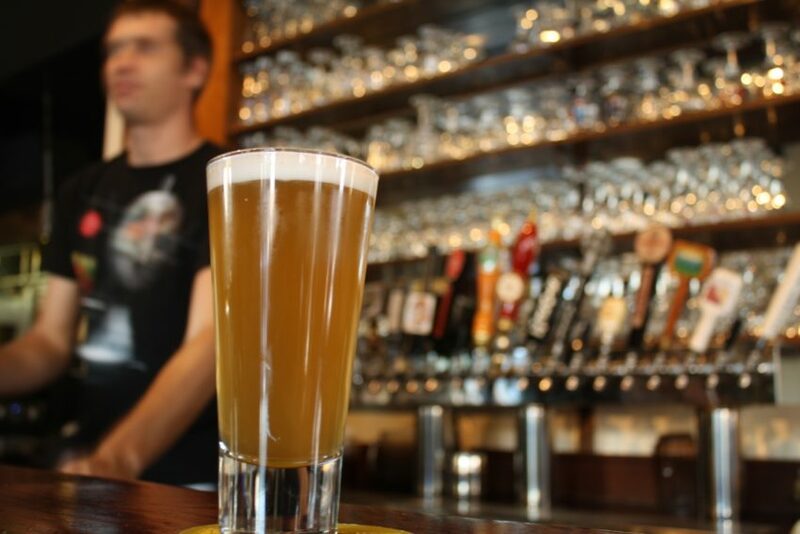 As the bar’s name implies, The Monk’s Kettle has a strong focus on Belgian-style ales; IPAs are mostly left behind and the selection of lagers is slim. Other major European ales, and North American craft beers, are the bar’s secondary and tertiary focus. The Monk’s Kettle was established in 2007, as craft beer was going from “available” to “ubiquitous,” and has kept the faith. Its beer menu not only covers all this ground, it has an extensive beer term glossary at the back. And it’s not snotty. Instead of going into the technical differences between a “dubbel” and a “trippel” it tells you in simple terms what they probably taste like. This is not only fine with me, it’s my ideal state. Belgian beers, particular the Trappist beers brewed by Cistercian monks, are the best in the world. Hands down. No question. You can argue with me (like Mission Local managing editor Joe Eskenazi does)m but it just means you are a bad person who has made terrible life choices (like Joe Eskenazi has). “Belgian-style” beers, if they’re well made, are the second-best beers in the world, and American microbrews are the third. Although the question gets murky at that point because so many American microbrews are better than so many Belgian styles … look, nobody said that ranking beers was easy. Only that IPAs are objectively terrible. All of which means that a trip to The Monk’s Kettle is a constant tug-of-war for me between the urge to try as many new things as I can, and the impulse to sit with my favorite Trappist beers, content to know that after a lifetime of searching the breweries of the world, it literally doesn’t get better than this. Tonight I was feeling the pull of new things, and so I started with an on-tap bourbon-barrel-aged Cuivre (The Bruery, old ale style, Placentia Calif., 16.2 percent [!] ABV). And oh, is it good! Like a richer, deeper, more subtle Barleywine. A four-ounce glass is $9.50, and so worth it. I’d happily drink that all night. I drank contemplatively and looked around – even with some spaces open at the bar, it’s noisy in here, too noisy to eavesdrop. Most of the other people around me were looking at their phones or reading a book. The only people really talking were people eating at the tables and a couple at the bar, all of whom had clearly come here together. And this troubles me. I love this spot, I love this bar, and I’ve had many social interactions here, but the bar doesn’t function as a bar. Everybody’s sitting apart, absorbed with something they brought in with them. This is one of those rare bars where you really do go for the drinks (and, to a lesser extent, the food); it isn’t a bar you go to meet people. You’re either an island, or you’re already with your crowd. Which is why my best memories of it are sunny afternoons sitting at a table outside talking to a close friend and discovering great new beers. Oh it’s so good for that. But I almost never come here at night because it’s too crowded to bring friends (a classic irony) and it’s a terrible bar to meet people. The bartender asked me if I was ready to re-up, and I asked him what he’d recommend to follow the Cuivre. One of the great joys of The Monk’s Kettle is the degree to which its staff really give a damn about the beer. Because the bar participates in International Péché Day (in which the Québécois brewery Brasserie Dieu du Ciel! sends out variations of its imperial coffee stout to a handful of bars around the world; I don’t know why it’s a thing either, but Dieu du Ceil! Is good enough to pull it off) they have a number of really interesting imperial coffee stouts on tap right now. And after talking it over we agreed that I should try the Péché Mortel Islay — an Islay-barrel-aged coffee stout (St. Jerome, QC, 9.5 percent ABV), and he gave me a sample. It’s a little more bitter than my palate usually goes, but it’s so beautifully put together that I ordered a glass anyway. The peaty scotch flavor always lingered wonderfully in the background. I tried eavesdropping again as I sipped. I couldn’t really tell what people were talking about – and there’s very little conversation at the bar – but it occurred to me that none of the conversations here were about beer. You’d think the customers here would get into arguments about beer all the time, but, I have never seen that happen. Why? Is this a bar for people who love beer? Or is it more of a bar for people to signal an interest in certain qualities, but not care enough to get heated about them? That would break my heart if it’s true. But I’m starting to wonder. And what seems undeniable is that, while The Monk’s Kettle is a truly great beer bar, it is not a beer scene. The bar was crowded by the time I had that thought. I’d clearly hit a fortuitous lull when I came in. It was time to go, but I didn’t want to leave with a bitter taste in my mouth. The bartender and I conversed for a few minutes on where to go next. The trouble was that I’d already had the heaviest ales they had on tap. There’s nowhere to go but up, and it’s a lot harder to manage an ascent than a decent into booze – it’s why flights almost always go from lighter to heavier. Eventually we decided to hit the bottle menu, and he smartly recommended a Scotch ale as a way to pull myself out of this. We selected a Jacobite Ale, by Traquair (Innerleithen, Scotch borders, 8 percent abv), which is brewed with coriander and fermented in oak barrels. It harmonized perfectly with the bitter on my tongue. We were proud of ourselves. And it was with that pride that I paid my tab and shoved my way out of the crowd, elbows first. Life is all about seizing the moments. I’d done well to come here, but I was tired of drinking alone. The Moonlight Special sour mash wheat lager at Monk’s Kettle. NextSnap: Who says a mask can’t grow hair? Loved the 1-2 Eskenazi snark punch combo! Always look forward to this column, keep the good work.